Have you ever felt shy or embarrassed to join a gym? Perhaps you are already a member of a gym but don’t have the courage to go. Many beginners feel ashamed of their bodies or intimidated by the regulars who are much fitter than them. Here are some tips to help you overcome your fears and look forward to regular gym visits. I’ve had several emails from people who are overweight and refuse to go to the gym for fear of others judging them. You should never feel this way. Everybody begins their journey and starts somewhere. There is nothing more inspirational than someone who takes charge and decides to become fit. People go to the gym to train and will not be judging you or your body. Anybody who does is inferior. Laughing at an overweight person who is working hard to improve their body is the equivalent of laughing at someone who is disabled in a wheelchair. Overcome your fear and join the gym. Did you know that 80% of a successful body transformation is simply showing up? Achieving your fitness and health goals is so much more important than what anyone else will think about your body. If you have no idea what to do, simply ask one of the employees to give you a tour around the gym. Ask questions and let them guide you. Let them explain what each machine does and if they can recommend a fitness program for you. Familiarizing yourself with the equipment and knowing what to do will make it much easier to show up and get started. Be cautious of uneducated professionals who tell you not to lift weights. You should be lifting weights regardless of your age or current fitness level unless you have a medical condition. If you still feel intimated by others, start going during less busy hours when the gym will be empty. The busiest hours are usually early morning (before work) or late afternoon (after work). 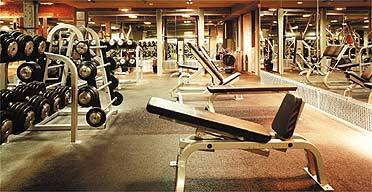 Lunchtime and the early afternoon is when most gyms are quiet. Training when nobody else is around will help you feel more relaxed and make exercising truly enjoyable. If you have work and are unable to visit the gym when it is empty, simply train during lunchtime on a weekend. This will help you feel more comfortable before visiting again during peak hours on a weekday. You will come across a lot of fit men and women at the gym. You will even see mothers and older people that have flawless bodies. Do not let this make you feel demotivated. These people may have been training for months or even years to build their bodies. Be inspired by them. If you keep working hard, one day you TOO will be in the best shape of your life. You might barely be able to run for one minute and notice someone else sprinting for 45 minutes straight. This might make you feel like the un-fittest person in the gym and not want to show up at all. However, with time, your fitness level will progress and your body will be doing things that you once thought was impossible. Ask your partner or a friend to join you at the gym. This will offer you support and make exercise more enjoyable. Let this person help you get over your fear of going to the gym and then become independent as the gym sessions settle into your daily routine. Never depend on your gym partner to make you go to the gym. In some cases, your gym buddy may quit altogether after a couple of weeks which will make you stop wanting to go too. Finally, remember the best project you can ever work on is YOU. Investing in a gym membership will not only transform your body, but your whole life too. Learn how to believe in yourself and transform your body.